So, what wallpaper to choose for the kitchen, given their practicality, the appropriate appearance and available varieties, consider all the parameters and the necessary requirements that must match the wallpaper used in the kitchen premises. 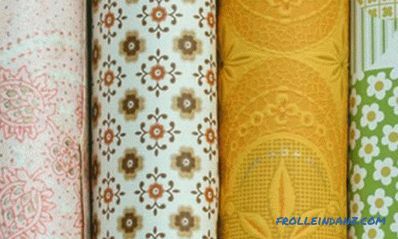 Most people, when they come to the store for wallpaper, try to choose them according to the design and the colors they like. True, this method of choice is only valid when the wallpaper is selected for a bedroom or a hall and not always. 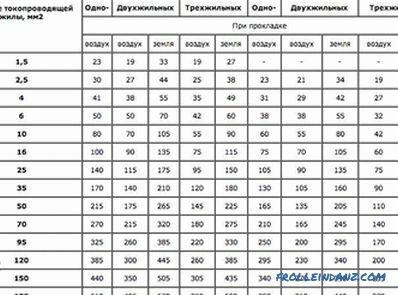 But when you need to choose wallpaper for the kitchen, then you need to use other selection criteria, based primarily on the durability of the wallpaper. 1. It is no secret that kitchen wallpapers should be resistant to temperature changes and to aggressive environments that take place in this room. After all, during cooking, on the wallpaper, soot is bound to settle, which affects their appearance and durability. So one of the main conditions for kitchen wallpaper is their moisture resistance. Moisture-proof wallpaper can withstand rubbing the places that are polluted with a rag. But at the same time to use detergents is prohibited. But if you choose washable wallpaper, they can be easily washed even with the use of household chemicals. Among the wallpapers of this kind, it is often possible to find super washable wallpapers that can not only be washed, but even be rubbed heavily with a brush. 2. Wallpapers that are stuck on the walls of the kitchen, very often fade in the sun. From this it follows that this wallpaper must have a certain light resistance. If you follow this condition when choosing wallpaper, they will retain bright colors for a long time. Even if the furniture is rearranged in the kitchen, such wallpapers will not leave ugly faded spots. 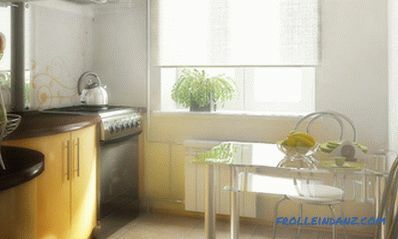 It is necessary to choose kitchen wallpaper, always paying attention to the rolls, which should have special icons. By these icons you can find out a lot of important and interesting things about wallpaper. For example, the “wave” icon means that the wallpaper is moisture resistant. If the wallpaper can be rubbed with a brush, the icon will be “wave with a brush”. Light-resistant wallpapers are marked with the "sun" icon. 3. Equally important is the density of the wallpaper. That is, if the wallpaper has a dense structure, this means that there is little pore and dirt and dust will not accumulate in them in large quantities. 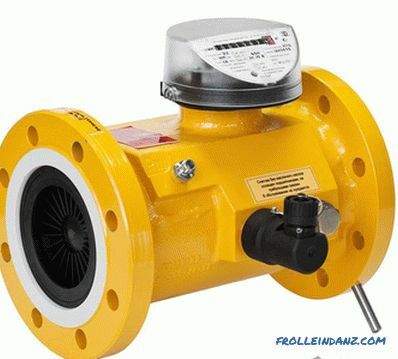 We can say with confidence that this indicator is directly related to the strength of the wallpaper and their durability. 4. Kitchen is a kind of production workshop in everyday life, so wallpaper can accumulate a lot of moisture. But in order for the kitchen microclimate to always be favorable, the wallpaper must have a good vapor absorption. Such wallpapers will not get wet, they will not accumulate damp and mold fungus. From all this we conclude that moisture-resistant, light-resistant, dense and vapor-proof wallpapers can be considered the best wallpaper for the kitchen. If the wallpaper will meet these parameters, they can withstand several cycles of washing, cleaning and even repainting. The fact is that vinyl is an artificial material that is not afraid of moisture, the sun's rays etc. In addition, if you paste the walls with such wallpaper, they will perfectly hide the shortcomings of the panels. They structurally have several layers - the bottom one, consisting of matter or thick paper and the top one - which is represented by PVC film for durability. True, you need to know that for the kitchen it is necessary to choose fairly dense vinyl wallpaper. Such wallpaper can rightly be considered ideal for the kitchen. They are hot stamping wallpapers “under stone, leather, textiles”, etc. Such wallpapers can be easily rubbed with brushes, washed with detergents with little or no harm to them. 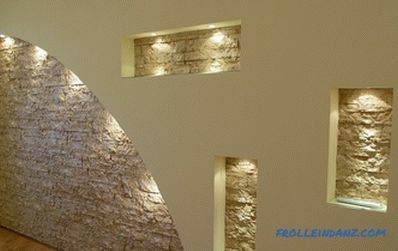 This wallpaper is quite durable, well hide the defects of the walls and with skillful use create a very beautiful decor. In fact, such wallpaper may have a paper or non-woven base. If everything is clear with paper, then non-woven fabric, as a material, is a non-woven fabric that makes wallpaper sufficiently durable. Non-woven wallpapers do not tear, do not crumple, do not swell, and in general have a very neat appearance. Here, special attention should be paid to white or colored vinyl wallpaper, which can be painted and repainted 5-7 times. Most of all will suit those who often want to change the atmosphere in the kitchen. These wallpapers have a number of advantages over other types of wallpapers. 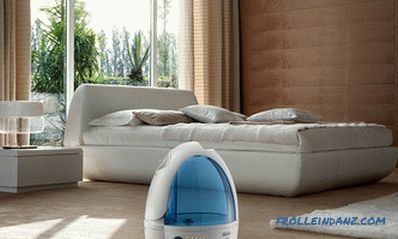 These benefits include the complete absence of a nutrient medium for harmful microbes, the inability to accumulate static electricity, and the absence of toxicity.And this is all despite the fact that fiberglass wallpapers have a very high vapor permeability, they are non-flammable, resistant to acids and alkalis. They can be painted 10-12 times without harm to them. If you paste the walls of the kitchen with glass fiber, you can completely forget that they will have to take care of them. To put it another way - they pasted glass walls on the walls in the kitchen, and forgot about them for a long time. This wallpaper can be considered one of the most inexpensive of all types of wallpaper for the kitchen. True, it is worth considering that this will have to sacrifice their service life, which is limited to 3-4 years. Yes, and the beauty of these wallpapers are no different. Although, it is for them that the statement “Cheap and angry!” Is true! These are thin wallpapers whose surface is smooth. As for the picture, it is thematic, i.e. "kitchen". The aesthetics of these wallpapers leaves much to be desired. But in order to glue them on the walls, you must first do their alignment. For the defects of the walls of this wallpaper do not hide, but rather protrude. And what about the color of the wallpaper for the kitchen? What should it be? 1. If the kitchen is small, then you should try to avoid pasting the walls with dark wallpaper with a large pattern. These wallpapers visually reduce the already small kitchen. Here it is best to choose plain-colored wallpaper of light color or wallpaper with small drawings. An interesting design option for a small kitchen. 2. 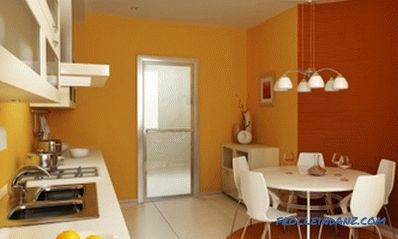 If the kitchen kitchen faces the north side, it is advisable to glue the walls with “warm” colors. With the kitchen, whose windows face south, it is worth doing absolutely the opposite. In other words, the wallpaper should be "cold" tones. These include colors such as blue, blue, green. 3. If the kitchen has low ceilings, then visually they rise perfectly, if you paste over the walls with wallpaper with a pronounced vertical pattern or with stripes applied in the vertical direction. If the kitchen is quite narrow, then it must be expanded, pasting the walls with wallpaper with a horizontal pattern. 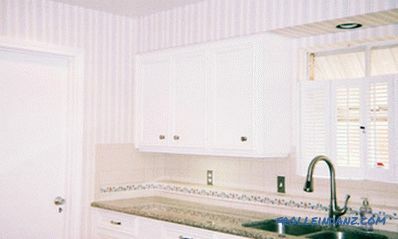 A kitchen option pasted in with striped wallpaper. 4. 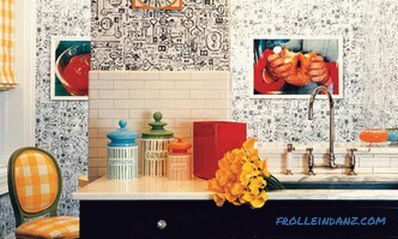 Among the owners of apartments, photowall-paper on which various still lifes or other "kitchen attributes" are depicted is becoming very popular. I must say that this choice is not accidental, because such wallpapers are able to make the room much wider. However, in this case, the picture should not be too bright or dark. Depending on the style of the kitchen and choose the wallpaper. For example, if the kitchen is decorated in a classic style, then it will be very relevant wallpaper with pictures in the form of still lifes, or dim floral patterns. Kitchen decorated in classic style. Country-style kitchens (rural style) will look great with wallpaper that has pastoral motifs on it. In kitchens with high-tech design, plain wallpaper will be appropriate. In principle, you can try to combine the wallpaper, thereby ensuring the zoning of the kitchen. It would be advisable to make the work area durable and resistant to external factors with wallpaper, with a not very beautiful pattern, but you can “close your eyes” to their unattractiveness. Although so that they are not spoiled prematurely by water or grease, such wallpapers are usually covered with sheet glass. The walls of the dining area should be covered only with beautiful wallpaper. At the same time, their longevity can be ignored. 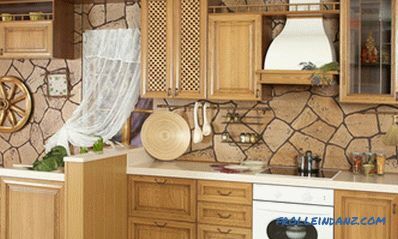 Very often, when designing a kitchen, wallpaper is grouped with other materials, such as tiles, decorative plaster, artificial stone, etc., which are often used to decorate kitchen walls.